Sending chills through all she touches. When in my shoes, the freakin' slush is. Frogma posted yesterday of her midwinter malaise, as she potatoed on the couch, shipping shome Shiraz. I was warm and cozy, in my Californianess - aloof, and above it all. Until I saw it. That photo she posted. Oh no! For thirty years, I'd been in denial. I'd left it behind in New Jersey. I'd put it from my thoughts. For thirty years, my socks had been dry, my toes toasty. I'd long forgotten what I'd run from all those winters ago. That soggy plague. But I got chills again, just looking at that photo. It all came slushing back. Slush is absolutely the worst thing there is about winter. It's inescapable, relentless. Snow you can walk on, trudge through, and brush off. It'll work with you. Puddles, the careful and judicious can avoid, they're at least transparent and show themselves. But slush is sneaky and evil, a witches brew. It takes on all forms, like silly putty. It hides its depth to the unwary. It mounds up, and climbs over the highest shoes. It knows if you've been naughty or nice, and gets you either way. Slush is the coldest substance on earth. And once it gets your socks wet, they never dry. Ever. There are countless romantic references in literature and poetry to snow and rain, the polite precipitations. But have you ever heard a song or poem about slush? Did Gene Kelly go singing in the slush? Did Robert Frost stop by the woods of a slushy evening? Did François Villon haunt us by asking, "Where is the slush of yesteryear?" Did Grouch Marx wonder...oh heck, you get the idea. Slush means always having to say you're soggy. Actually there is a rather touching song about slush, by Jarvis Cocker. We had just enough snow here last week to make snowmen and have a snowball fight and have it feel squeaky underfoot, and it came down in those big wet clumps looking nice and Christmas-cardish, and it was gone in a day. Works for me. Escape, you are indeed fortunate. Tillerman, I wonder if there isn't a whole body of slushy literature that I've missed. I knew the work of Joe Cocker, and his distant cousin Alter, but hadn't heard this before. Thanks for sharing. Neither had I O Docker. Apparently Mr. Jarvis Cocker comes from the same town in England as Mr. John Robert "Joe" Cocker, and Mr. Jarvis Cocker's father Mr. Mac Cocker is a DJ in Australia where, according to Wikipedia which is never wrong, "he did not counter a common impression there that he was Mr. John Robert Cocker's brother or cousin. Despite both being from Sheffield, they are not related in any way." I am not familiar with the work of Mr. Alter Cocker. Is he related to the famous pontoon boat pioneer Mr. Hobart Alter? This is not about sailing , God will be pissed! 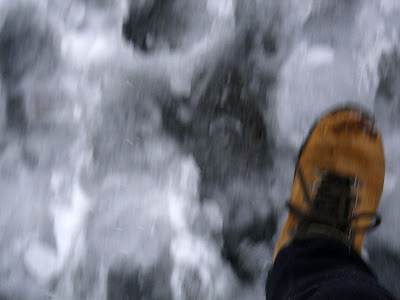 I hate slush, more so when it looks like it is snow, but it is really just deep slush, it is a tricky SOB! THANK GOD I DO SEE SNOW OR SLUSH OR FREEZING RAIN! Zen, again you surprise me. As you often explain, all things in life are related, and so it is with slush and sailing. Thinking about slush and knowing that somewhere there is slushiness in the world helps me to better appreciate the absence of slush on O Dock and on our glorious bay. Tillerman, I'm afraid you'll have to do your own Googling to discover Mr. Cocker's identity. Indeed master O-D, I bow to your wisdom! I sometimes am lost in the illusions of the moment and fail in broader sight, blinded as I am by the warm rays of sunlight dancing on the calm water of the Bay. Forgetting that what once was my past is still the present somewhere, for time itself is an illusion. Crooked politicians and tycoons love their slush funds. And, semi-frozen water isn't the only form of slush. Oils, greases, fats, mixed suspensions, runoff, and other substances can form all sorts of lovably slushy substances. Pat, In fact, last year during a particularly nasty cold spell the diesel fuel in my VW turned into a nasty slush which left me walking to work at 5:00 AM. O'Docker tell us more about your glorious bay, which I assume is also warm. Update from the hinterlands, tomorrow is predicted to reach 48 degrees. The last time we went sailing last October it was 48 degrees. Spring seems eminent and hope springs eternal. Now if the 3 feet of ice would hurry and melt we would be set. Isn't that what one says/does after stepping into a pothole filled with slush? You may be right, Pat. I can think of a slushy tequila mixture that has some redeeming qualities. And yes, Captain Puffy, I should post more about sailing than about slush - 48 degrees is about as cold as it ever gets here. Could I have my slushy with rum, please? I'll use the slush recipe in "The Official Parrot-Head Handbook." A high coup from Panda! Still, I approve of the spirit(s).